Sometimes you just need an easy weeknight meal, and this is one of them. Most of the ingredients you probably already have in your pantry or freezer. Set the pasta to cook and steam the Asian vegetables until cooked. The best way to make sure the sauce is evenly distributed across the whole dish is to make the sauce in the bowl that you will be serving the pasta in and simply add the cooked pasta to the already made sauce rather than adding the sauce to the pasta. In the large bowl combine the peanut butter, garlic, lime juice, soy sauce and sesame oil. Whisk vigorously until the mixture is combined. Once the pasta is cooked, slowly add it to the bowl of sauce, about 1/3 of the pasta at a time to ensure that it is properly coated by the sauce. Once all the pasta has been added then add the cooked vegetables. The dish can be served as a side or if you can add some cooked grilled chicken for a main dish. A few days ago I went grocery shopping and due to the oncoming blizzard there were very few cartons of eggs left and I got stuck grabbing a pack of 18 vs my normal dozen. This caused me to look up a bunch of egg recipes, and this soup was one of the better dishes I was able to make. In a large pot bring vegetable broth to a boil, then add the ginger and the soy. Remove 1/2 cup of broth from the pot in a small cup and add the cornstarch and mix until the cornstarch is fully integrated. Add the cornstarch slurry to the pot and mix until the stock thickens a bit. Reduce the heat to a simmer and begin stirring the mixture in a clockwise motion, then slowly add the egg mixture a slowly so that the egg feathers. Once all of the eggs have been added, turn the heat off and add the green onion. This is a modified version of Mark Bittman’s master paella recipe using shrimp and sausage. I made the same thing but omitted the meats for my girlfriend and she loved it. Put 3 tablespoons of olive oil in a large skillet on high heat. When the oil begins to shimmer add the garlic, onions, zucchini, mushrooms, and peppers. And sprinkle on some salt an pepper. Cook until the onions have softened. Add the rice, saffron, and paprika; stir together until the rice takes on a sheen. You may need to add a touch of oil to the pan if it’s dried out. When the rice has a nice shine on it, add in about 2 cups liquid and stir to combine. Place the shrimp on top of the rice. Cook for another 5 more min, or until the rice is cooked to your preference, taste and add more salt if necessary, you can add in a touch more liquid too. Once it’s done let it sit for about 1 min then serve. This is actually a really simple recipe that can be prepped the night before to allow for a quick breakfast the next morning. Just dice up all the veggies and store them in the fridge, the next morning all you need to do is mix and bake the whole thing. Pre-heat the oven to 350°F. Turn your stove to medium and in an oven safe pan (I use cast iron) heat 2 pats of butter. When the butter has melted spread it around the pan to make sure the interior of the pan is fully coated. Then add the vegetables and cook until lightly brown. Season the veggies with salt (be careful the goat cheese is also pretty salty), pepper and the crush red pepper. Once the veggies are almost soft add the egg mixture over the top. Before the egg mixture has settled add the goat cheese. Let it all cook for about 2 min until the bottom of the mixture seems to have almost set then place the mixture uncovered in the oven. Bake for about 6min or until the eggs have reached your desired level of firmness. For the month of March I'm challenging myself to eat at least one 100% vegetarian meal a day. I'm doing this partly to improve my health but also as a way to expand my knowledge of vegetarian recipes. When I started dating a vegetarian girl I got Mark Bittman's How to Cook Everything Vegetarian and it's a great source from which I've adapted a number of recipes. Today's recipe is pretty simple but also delicious. My take on a greek salad. In a small bowl combine the oil, vinegar, a pinch of salt, a generous grind of pepper, the garlic, oregano, and mix. Or if you're feeling lazy like me use the smalled container for your blender. In a large bowl toss the lettuce, cucumbers, tomato, onion, olives, mushrooms and red pepper. Top with the dressing. When serving put some goat cheese crumbles on each plate and enjoy. Risotto is one of those things that people think is hard to make but really it just requires patience and practice. The first time you make it the risotto won't be great, but the next time it will be good, the third time it'll be amazing. Below is a basic recipe and can be easily modified to change the flavors. In a large pot add 2 tablespoons butter and a bit of olive oil over medium heat. When the butter has melted add the onions. Cook for about 5 min until the onions become soft. In another pot keep the stock at a low simmer. Slowly add the rice allowing all of it to be coated by the butter. Toast the rice for about 2-3 min until it become lightly golden. Add some salt and pepper. Then add the wine stir allow the mixture to simmer until all the liquid has been absorbed by the rice. Add a generous pinch of herbs and mix. Slowly add the stock about 1/2 cup or a ladle full at a time. The goal is to barely cover the rice. After adding stock mix the rice and make sure it isn't sticking to the bottom of the pot. Once all the liquid is almost gone and the bottom of the pot is dry, add another ladle full of liquid. Keep repeating until the rice has absorbed the majority of the liquid. This should happen over 20 min at which point you should taste the rice for doneness. It can take up to 30 min for the rice to cook and you may not use all of the stock. Once the rice is cooked to your liking, kill the heat and slowly add in the remaining butter a pat at a time and gently fold the mixture. Once all the butter has been incorporated add in about 1-2 tablespoons of the goat cheese crumbles and mix. The risotto can easily be a main course or the side to a good piece of grilled meat. Here I've served it with a side of the roasted mushrooms from an earlier post. Chicken breast is one of the simplest and healthiest things you can cook but often it comes out dry. The sous vide method really keeps the meat tender without adding a any fat. The following is approximate since I really did it by feel and taste. Combine all the marinate ingredients in a small bowl and taste to see if you want it spicier or saltier. Place the marinate and chicken in a bag and vacuum seal. After removing the chicken from the pouch sear in a hot pan for about 1 min each side. The chicken is super moist and you don’t even need a knife to cut through it. I served it with a side salad. Leftovers have lead me to develop some of my best breakfast dishes. The following is a result of having a baked potato and some small fingerling potatoes in the fridge. In a large oven safe pot over medium heat add a pat of butter and enough olive oil to cover the bottom of the pan. Add the potatoes, bell pepper, onion, and mushrooms. Season with salt and pepper. Pre-heat oven to 400. Once the vegetables have softened to the point of almost being done, add the green onions, rotel, and the herbs. Mix throughly and cook for another 2 min. 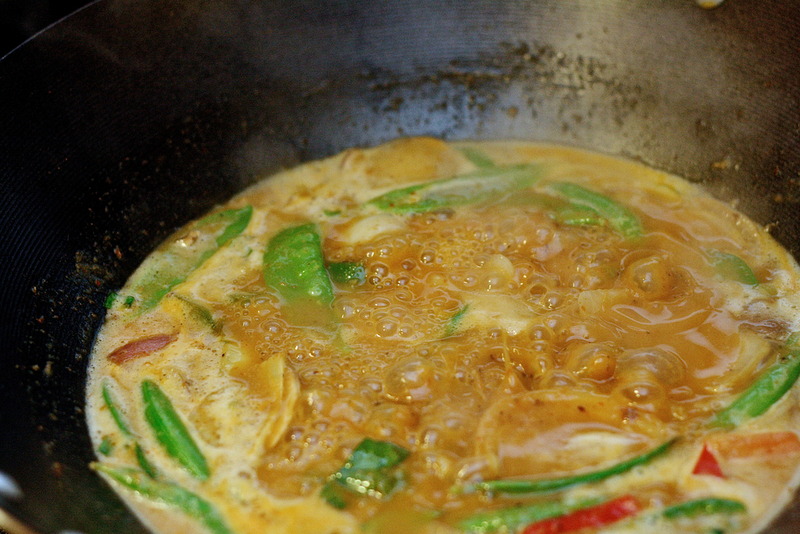 Add the eggs into the vegetable mixture, and mix throughly. Put pot in the oven and bake until the eggs have set about 4 min. For a crispy top broil for about 2 min once the contents have been cooked. This is a recipe I've adapted after trying a bunch of different recipes but found that none of them really had the flavor I wanted. It's a pretty simple recipe but it requires a lot of time and effort. Mince the 4 pieces garlic and mix with the butter and about a tablespoon of olive oil. If you have a small chopper I recommend throwing the mixture in there and let the blades do the work. Let the mixture sit in the fridge and firm up for about an hour. This can be made ahead of time. Pre-heat the oven to 300 degrees. Cut the italian bread in half long ways and spread the garlic butter oil mixture across the bread and let bake for about 20min or until the bread is lightly brown. While the bread is baking mix the vegetables, salt, pepper, olive oil, herbs, and garlic in an aluminum try. Bake the vegetable mix for 25 min. Stir the mixture every 10 min or so. When the bread is done baking let it cool then cube the bread into small even pieces. Mix the bread cubes with the vegetable mixture. Pour enough of the vegetable stock to make the cubes moist but not sopping wet. Put the mixture in an 400 degree oven and bake uncovered for 25 min. Stirring the mixture every 10-15min. Serve with your favorite piece of meat or as hearty meal on it own. In the words of Deckard Cain stay a while and listen…. Now that I live with a vegetarian I do cook a lot more veg food than I did before; but my old roommate was pretty much a vegetarian too so I’ve been making this recipe for a few years now. I don’t actually remember where I found the original one but over the years I’ve come to modify it for a number of cooking methods. While I’m currently making the ratatouille in the winter I find that the quality improves greatly in the summer with the fresher produce. Also it’s possible to grow almost all the ingredients in a small garden. Slow Cooker Version Combine all the ingredients and add extra water to cover if necessary. Cook on low for 8; or high for 4. Every hour stir the mixture. Oven Version Combine all the ingredients in an oven safe dish and cook at 350 for 2 hours covered and 1 hour uncovered. Stove Top Version 1. In a large pot on medium heat, add the olive oil and garlic. When the garlic becomes fragrant add the mushrooms and red pepper. 2. 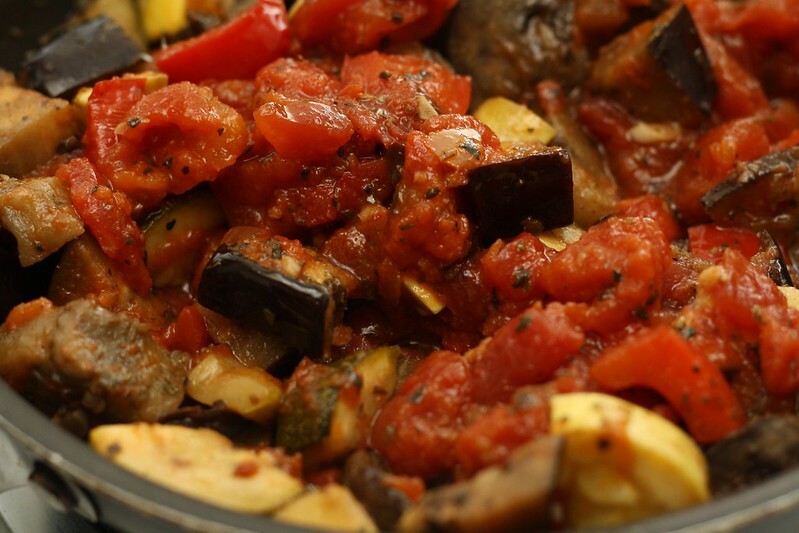 Once the mushrooms have becomes slightly soft add the jalapenos, eggplant, squash, and zucchini. Mix well and let sit for a few minutes before adding the Italian seasoning. 3. Add the tomatoes and mix well. Turn the heat to low and cook for another 30min or until the vegetables reach your preferred level of doneness. This can be eaten as a hearty stew, on top of rice, or my favorite with a large piece of garlic bread. There were mushrooms in my fridge and a slow cooker on my counter and so we get this easy side or main dish. Heat the slow cooker on high for about 5 min then add a large pat of butter and some olive oil to cover the base. Add in the herbs and garlic. 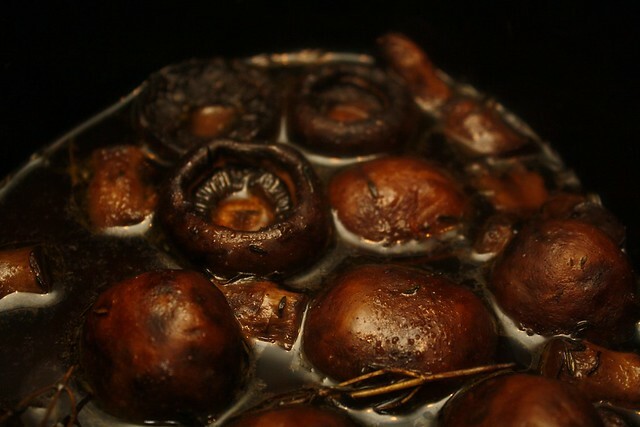 Clean off the mushrooms and remove the stems and toss with the oil. Liberally sprinkle the salt and pepper over the mushrooms and add ¼ of a cup of water. Slow cooker recipes are pretty standard in cooking: 6 on low, 3 on high. I added the mushrooms to some freshly cooked pasta for a pretty filling meal but they also make a great side for a piece of meat or as topping on a burger. When I was an undergrad there was this great food truck on campus that sold nothing but crepes both sweet and savory. The place was fast, cheap, and delicious. Fillings can be whatever you like, I had frozen strawberries, nutella, and some black raspberry jam. In a blender combine the butter, eggs, milk, water, and vanilla extract. Blend for 1 min until the egg yolks break. Then add he flour and blend for another 1 min. Store the mixture in the fridge for at least an hour to chill. Using a small ladle pour the batter into a small non-stick pan that has been well buttered. Pour the batter into the middle of the pan and move the pan around to evenly spread the batter across the pan. Cook the crepe for about 40 seconds then flip. Cook the second side for 30 seconds. 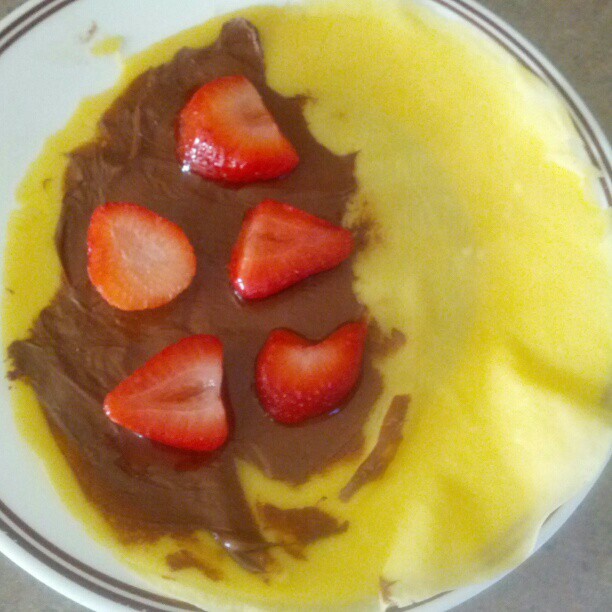 I found it hard to flip the crepe without removing it from the pan onto a plate then putting it back into the pan. Fill the warm crepes with your choice of filling and enjoy. The made crepes should be stored with wax paper between crepes to prevent sticking and can stay good for 8 days in the fridge and 30 in the freezer. In a large dutch oven heat 2 tablespoons of oil and a small pat of butter until the butter melts. Add Onion and Garlic until the onion becomes translucent. Add spice mixture and mix throughly. Once the spices become fragrant add the beans, rotel and corn; mix throughly. Cook over medium heat for 10min then add vegetable stock. Bring mixture to a simmer and cook for 30min. Then bring mixture to a rolling boil and add rice. Cook for 20 min stirring frequently. While the rice is cooking make the tortilla strips. Cut up 8-10 tortillas into strips. Pre-heat oven to 450. Mix the strips with a generous amount of olive oil and spread onto a single layer in a lined sheet pan. Cook for 6 mix or so, stirring halfway through. 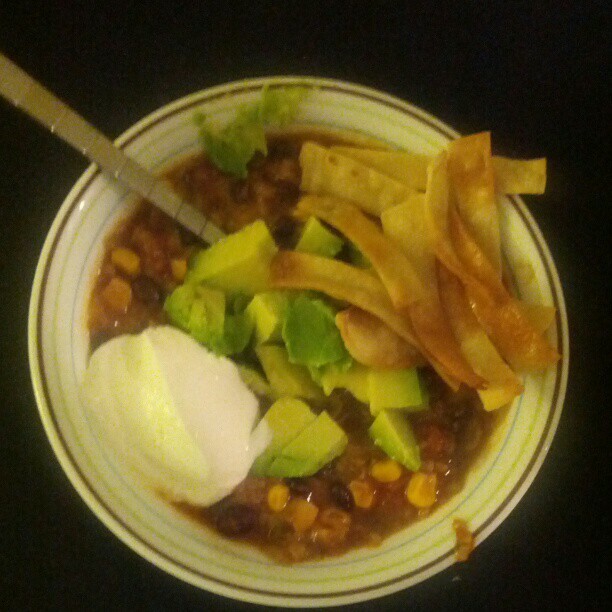 Serve the Gumbo with cut up avocado, tortila strips, cheese, and sour cream.